Hong Kong’s more than 340,000 foreign domestic workers comprise 5 percent of total population in the territory and can be found in one of every seven households. That number is steadily increasing as more and more Hongkongers are becoming rich. By law, wages should be paid not later than 7 days after the end of the wage period or date of termination of contract. The cycle is based on the starting date of employment. Often, employers who forget to pay salaries on time argue various reasons like unavailability of their ATM card, sickness or being too busy. It may happen once or twice, but if done on a regular basis - and is putting the helper in a tight spot - the employer is liable for criminal prosecution. This is actually a common complaint among domestic helpers. The only legal contract for FDH in Hong Kong is the Standard Employment Contract. 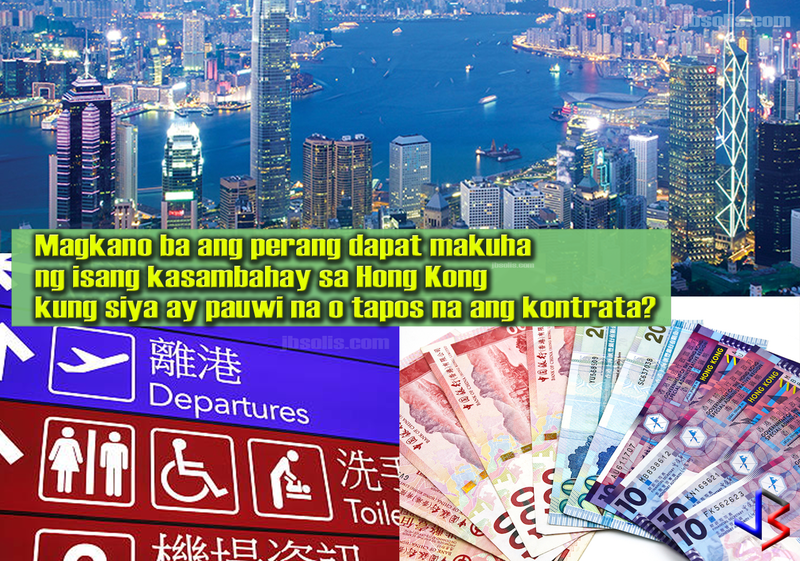 Here, the minimum salary for FDH is HK$4,310 per month. It can go higher as the employer sees fit, but it should not be any lower than this. Any deduction of wages must be within the legal limits. In cases where the damage to employer's property is due to helper's negligence, the amount deducted shall be reasonable with the property's value but not to exceed HK$300 for each case. The total deductions in each wage cycle should not exceed one half of the wages payable in that period. Deductions due to absence from work should not exceed the sum proportionate to the period of absence. Any other deductions - such as fees paid by employer to hire a helper, medical expenses, use of water and electricity, among others - are prohibited. Employers are required to pay for expenses incurred by the domestic helper related to her employment such as insurance and medical examinations, visa fees, authentication fees and administration fees imposed by relevant government authorities. Some employers fail to pay back the expenses even if they are by law required to fully reimburse such expenses upon demand and presentation of corresponding receipts or documentary evidence of payment. 4. They fail to provide Sickness Allowance, Sick Leave and Injury Compensation. Many are not aware that domestic workers are entitled to free medical consultation, maintenance in hospital and emergency dental treatment. In accordance with local laws, helpers are also entitled to compensation if they suffer sickness or injury by accident arising from the nature of their employment. A domestic worker is entitled to two paid sick leave days every month for the first year of employment, and after that, four paid sick leave days every month. Paid sick leave days can be accumulated. If helper is sick and he or she presents an appropriate sick leave certificate, he/she should be allowed to take sick leaves. The daily rate of sickness allowance is a sum equivalent to four-fifths of the average daily wages of the helper. Some employers fail to provide this, expecting helpers to work daily, regardless of their health condition. 5. Employers are not providing adequate living conditions. Helpers must work and reside in their employer’s residence as specified in the contract during the whole employment period. The employer has to provide free, suitable and furnished accommodation with reasonable privacy. While this rule is a bit objective and considering that small apartments are actually common in Hong Kong, some employers simply convert the laundry room or small storage room to be their helper's room. In some cases, facilities required by law are not provided free. One study showed that 3 of 5 helpers are not provided adequate accommodation. A British expat showing their apartment, and the "proper" helper's room allocated. 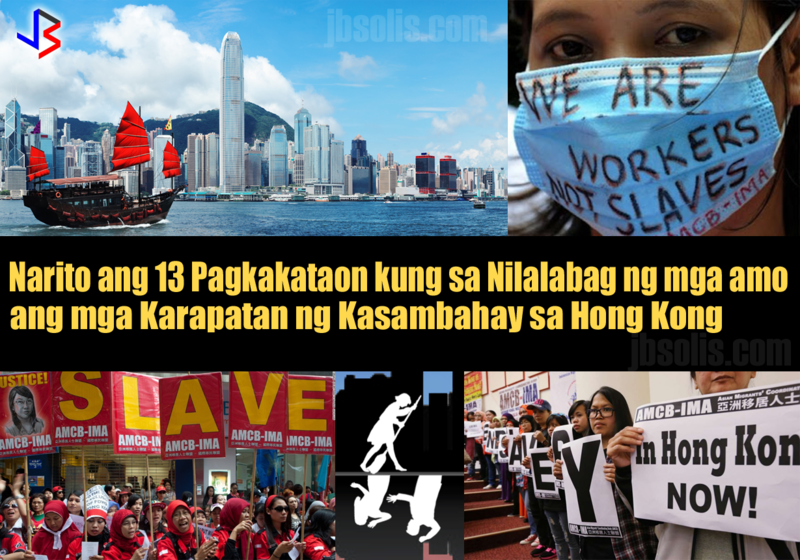 The working hours for Hong Kong domestic helpers are really long. Sadly, working hours are currently unregulated or capped. But some employers are inconsiderate, keeping their helpers awake for long hours and requiring them to wait until everyone else is asleep. Helpers are also expected to wake up at any time if needed by their employers. These may not be violating any specific rules where there are none, but they are certainly not up to International Labor standards. 7. Employers fail to provide adequate food. Domestic workers should be provided food by their employers. In lieu of this, employers are required to pay them HK$1,037 per month as meal allowance. Most violators do not choose the food allowance provisions. Instead, they only allow helpers to eat after everyone else have finished eating, often leaving only leftovers. Some employers bring their helpers with them during shopping or outings but do not include their helpers when ordering food, leaving helpers to pay for their own food. 8. Employers violate their helper's day off. The standard employment contract stipulate that helpers must spend one day off for every seven days at work. The rest day is defined as a continuous period of not less than 24 hours. Some employers fail to acknowledge this, asking helpers to do work during day-off. Others try to shave a few hours from the mandatory rest day, asking helpers to finish chores before leaving. Some implement early curfew hour, citing safety concerns, but actually wanting to get their helper back early to tidy up a full days mess in the house. The law allows helpers to work during off days, but both parties must agree too it. This is what some employers take-advantage of since some helpers could not say no out of fear. 9. 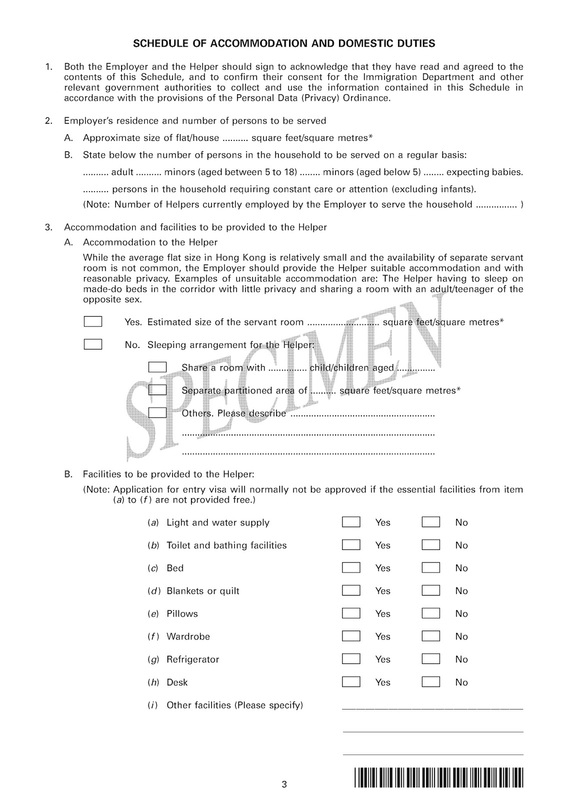 Employers require helpers to do non-domestic duties. 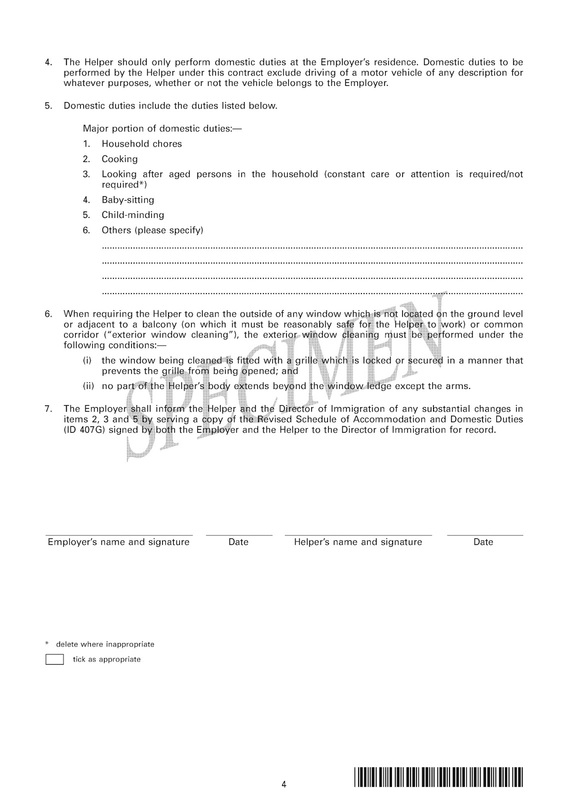 The law requires helpers to perform domestic work only, as stipulated in the contract. Asking helpers to do tasks outside the one listed in the contract is a labor violation - tasks such as performing body massage, cleaning the car or working in their employer's business. Also, cleaning of windows is strictly limited to certain condition as stipulated in the Standard Employment Contract. Many helpers could not refuse for fear they might anger their employers. Some employers take their helpers to work in other residences - parents' accommodation, their store or place of business. Even if, in some cases, both parties are willing, or if they agree to some form of overtime payment, this is illegal and both the employer and the helper are in violation of the law. 11. They fail to pay proper long service or end of service, as well as other end of contract benefits. Long service is a form of gratuity payment paid to domestic workers who have served an employer over a period of not less than five years. The amount is computed based on the latest monthly wage and number of years. See: How to Compute Severance Payment or Long Service Payment in Hong Kong? Sadly, some eligible domestic helpers fail to receive this amount due to lack of awareness or employers flat out refuse to grant this amount. Because of the two-week rule, helpers who encounter such experience have a limited amount of time to chase employers before they are sent home. Other payments or sums given to helpers at the end of contract are free return passage (or plane ticket) and food and travelling or baggage allowance. Some employers simply give tickets and not the others. Foreign domestic helpers are entitled to 12 statutory holidays in a year, irrespective of how long they have been employed. The first day of October. Employers are required to present proof of payment of salaries and allowances given to their helpers. This is done by means of receipts. The helpers must sign the receipts to acknowledge that they have received the correct amount of salary. It is a violation if the employer does not do this. Similarly, having a helper sign a receipt which does not match the actual wages or allowances - either by coercion or agreement - is also illegal. Use the tell "me@1823" App - a free application where you can text or voice recording, upload photos, and provide your location on a map to the Labour Department for assistance. 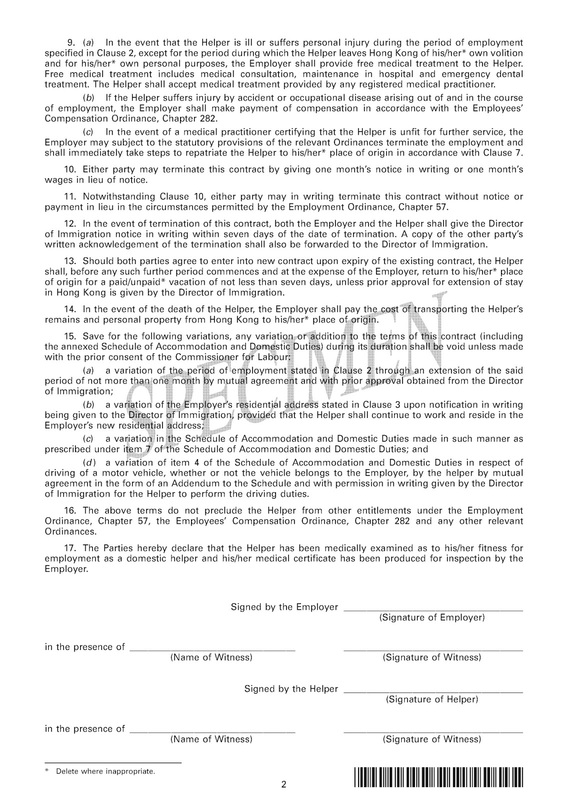 Below is a SAMPLE copy of the Standard Employment Contract. 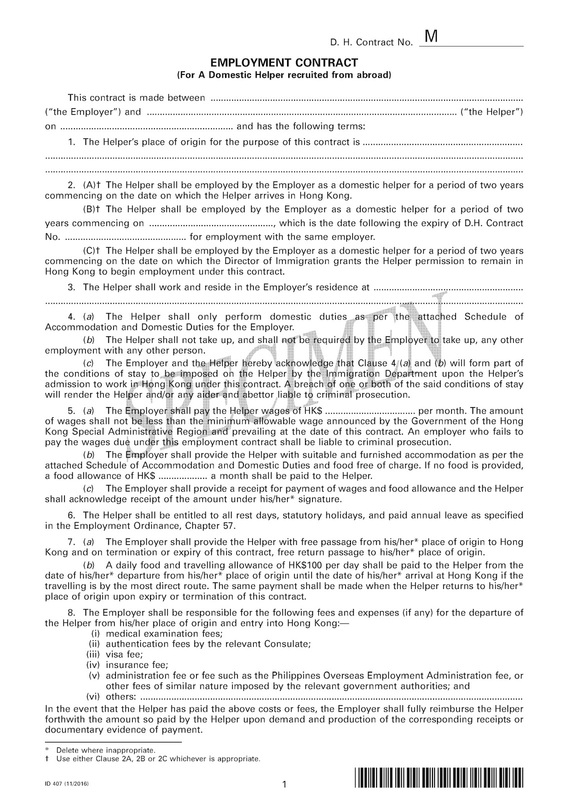 It is the only legal contract for Foreign Domestic Helpers in Hong Kong. The use of another contract is illegal. 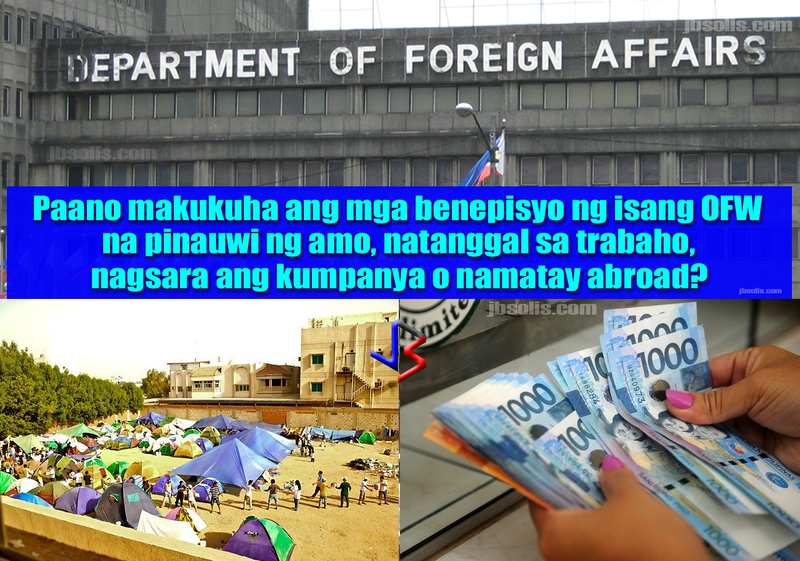 What are the Procedures to Claim Back Wages, Compensation, End of Service, or Death Benefits for Repatriated OFWs?